Short break vouchers on sites such as Groupon may seem like a bargain, but consumers are being seriously misled by many of these daily deals. An undercover investigation by Which? Travel found that some websites are advertising low prices that no longer exist, along with holidays that can’t be booked. When we mystery-shopped the UK’s three biggest voucher deal sites – Groupon, LivingSocial and Wowcher – in a third of cases, the price that had lured us in was no longer available. 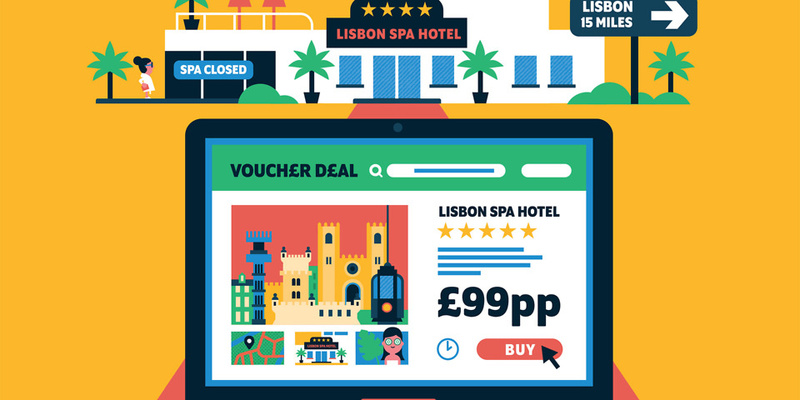 One agent for Super Escapes Travel, which was selling a five-star Lisbon spa break through LivingSocial, tried to palm us off with a lower quality holiday when we rang up to redeem our voucher – as well as quoting a £60 supplement. If this switch was proved to be intentional – dangling one package like a carrot, only to substitute it for an inferior and more expensive one later on – this Lisbon break isn’t just a bad deal, it could be criminal. Groupon, LivingSocial and Wowcher act as middlemen, flogging everything from meals out to garden furniture. With holidays, customers pick their destination and dates with the voucher deal website – and pay their money. But this isn’t a booking. They must then contact the travel agent operating the holiday with their unique voucher code. This is where their contact with the deal site ends, and the problems begin. Posing as a potential customer, we rang the merchant to check the availability of six short breaks being advertised on each of these popular sites. When we called Super Escapes Travel, the agent told us the Lisbon trip was sold out at the advertised price. Instead we were offered an alternative – a ‘city centre’ four-star hotel, at an extra cost of £30 per person. But a quick Google search revealed this lower-grade property didn’t have a spa, like the deal promised, and was, in fact, 15 miles from Lisbon – a 30-minute drive away. And we aren’t the only ones to have a poor experience. Almost half of Which? members surveyed reported problems if they bought or received vouchers for a short break or leisure activity. When our Lisbon spa deal fell flat, we wanted out. But the agent at Super Escapes Travel incorrectly told us the voucher was ‘non-refundable and non-transferable’. The bottom line – cough up the £60 supplement, or we’d lose the holiday and all the cash we’d already paid. That’s despite LivingSocial having a ‘no-quibble’ 14-day money-back guarantee on unredeemed vouchers. We found all three sites had a similar clause buried in their terms and conditions. Yet, many of the travel agents operating these deals didn’t tell us this – giving us vague or inaccurate information during 11 out of 13 calls we made. We were entitled to our money back, rather than paying a supplement. So why weren’t we told this over the phone? Instead the agent at Super Escapes Travel was determined to sell us a pricier alternative. ‘If you delay, prices will go up,’ he warned, while pressing for the lead passenger’s details – and using every trick in the book to keep us on the line. When we put these issues to LivingSocial, it told us that ‘this is not something it tolerates from its merchants’ and said it had reminded them of customer cancellation rights. We found deals that couldn’t be booked on all three voucher sites. For Wowcher breaks, we were quoted a supplement on five out of six occasions when we called the travel agent. With our Groupon voucher, one agent tried to charge us a whopping £200 extra per person to book a holiday we thought we had already paid for. The Consumer Protection from Unfair Trading Regulations state that retailers must have a meaningful quantity of a product available to meet demand. So how many people snapped up the Lisbon spa break before it sold out? According to LivingSocial’s website, only two. Nonetheless, the ‘£99pp’ ad ran for a further three weeks without alteration. Wowcher, which also owns LivingSocial, told us it follows Advertising Standards Authority (ASA) guidelines to ensure at least 10% of products are available at the ‘from’ price. But that still means 90% of customers could end up disappointed, only finding out after they have paid. We also approached Super Escapes Travel. However, the company declined to comment on our findings. Supplements weren’t the only problems we found. Even when we could book the price on offer, the holidays weren’t always as advertised. A break to Prague on Wowcher guaranteed a minimum of 40 hours at the destination. But travel agent Tour Center offered us a package that amounted to just 35 hours in the Czech capital. We also found a Groupon getaway to Venice with KPX Travel where the hotel was located in mainland Italy, 10 miles from St Mark’s Square. The only hint was the ad’s suggestion that guests take ‘a short trip to explore what Venice has to offer’.